Brighton & Hove Albion manager Chris Hughton is delighted with the squad at his disposal after the winter transfer window closed yesterday. 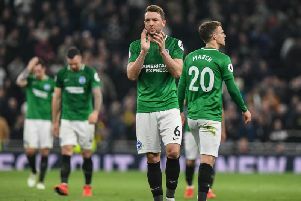 The Seagulls did not add to their first team squad during January but Hughton admitted he would have pushed to make signings if he felt he needed to. Alireza Jahanbakhsh and Mathew Ryan are now back from the Asian Cup and Bernardo could return to action at home to Watford on Saturday after a hamstring injury. Winger Jose Izquierdo is the only player out injured at the moment. Fringe players Markus Suttner and Ezequiel Schelotto both left Albion on loan during January and asked about the squad he has available for the rest of the season, Hughton said: "I'm delighted. I can tell you that if I felt we needed to do something I would have been pushing. "For us, it's very much making sure we stay in this division and come the end of today (January 31), there are no more possibilities for us to bring anybody in. "We've seen that more with Max (Sanders) and Viktor (Gyokeres) but we've got an under-23 squad who have acquitted themselves very well.